Nothing has such a familiar feel as a home, a trusted environment or a daily routine. Sofie Van der Linden uses these settings and elevates them from commonplace surroundings to intriguing architectural drawings. Her illustrations are accurate and unfinished since she does not use shadows or color. Lines cross one another in transparent constructions. The idea of an architectural drawing is given a new interpretation: instead of merely surveying she profoundly analyses her surroundings which results in drawings that are schematic, distant and universal yet detailed, intimate and personal. Sofie Van der Linden investigates the effects of our memory. 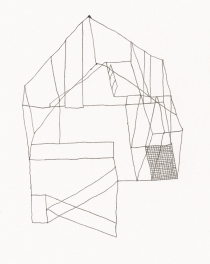 She sketches familiar houses, her own home or the route to her old school, by head. Certain details which she does not remember remain white. She displays what is important to her and how our memory functions. Mental images of certain venues are rarely identical. This resulted for example in a variety of different sketches of her own apartment, with none of them being identical. In addition, Van der Linden draws interiors of strangers. First she sends a letter and when she does not receive a response, she simply rings the door. It is not unusual she receives negative replies. When she does get offered to enter their house she starts with mapping the venue while adding notes. Afterwards, she mentally walks through the house – often starting at the front door – while sketching. The point of view changes and inaccuracies appear since scale or objects in her memory do not always correspond to reality. When she is not able to draw certain details she writes down a description. Rather than the aesthetics of a house, she likes to describe rooms in such a way that they awake new memories. 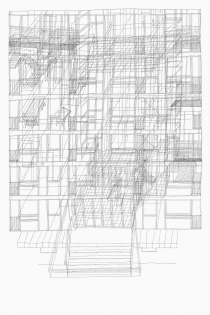 Recently, Van der Linden used memories of others instead of her own to create her architectural drawings. As part of a project in CIAP, Hasselt (B) (2013) she reconstructed a torn down mansion based on descriptions of people who once entered the house. Van der Lindens work may seem voyeuristic but entering the personal atmosphere of strangers is not her ambition. She is fascinated by the influence of space: how we stand in a certain room, how we relate to this venue or how do different venues relate to one another. She creates with her drawings a new way of observing our surroundings and hands the viewer different views of our surroundings.